Construct is a multi-purpose template that is loaded with options, and is fully responsive (try resizing your browser). It contains a total of 59 HTML pages! We carefully handcrafted Construct with a strong focus on typography, usability and overall user-experience. It comes with detailed documentation and free support. We care about your site as much as you do and will do what it takes to help in any way possible. Construct has a ton of awesome features, 8 home page layouts, 7 total sliders (2 premium sliders), multiple portfolio layouts, multiple blog layouts, and numerous interior pages that are loaded with different layout options. We have highlighted some of the top features below and have a full list below that. We hope you enjoy Construct! Construct includes 8 different home page layouts, each one is unique and offers a different slider along with different layout options. There are so many variations, allowing you to create numerous different looks with one template. Construct includes 7 total slider designs, 2 of which are premium sliders! The OnebyOne slider leads the pack with its aweomse effects and the Unleash Accordion Slider is the second premium slider. All of them have amazing effects and a great design, giving you many options for displaying your main content. Along with the 3 premium slides, Construct also includes the Piecemaker 2 and FlexSlider. Construct is 100% responsive and can automatically adapt to any screen size. Try resizing your browser window to see the adaptation. Not only is Construct responsive but it also keeps the clean, modern design all the way down to smaller screen sizes such as iPhones. Every element has been tweaked for different screen sizes to make sure it looks great no matter what the device. Now people can easily browse your site using smartphones, tablets, laptops or desktop computers. In addition to the 8 home pages and 7 sliders, Construct has so many options to use that your possibilities are endless. The interior pages (team, services, process, testimonials & pricing pages) all have numerous different layout options. You are not stuck to one type of service or testimonial option. Check out the demo to see them all! And Construct also includes other pages such as; contact, about us, FAQ, Left Nav & Sidebar, Right Nav & Sidebar & full width. Construct includes 7 different types of portfolio layouts and each type has at least a 1-4 column option. And, it also includes a gallery type layout that goes from 1-4 column. We also provide 4 different layouts for the blog pages. Construct really is loaded with different options, check out the demo to see them all! Construct provides numerous different shortcodes making your page building even easier. Construct includes all of the PSD’s, a total of 51! Every page that was laid out has a PSD file so you can easily use it to customize the design ever further! All of Squidix themes and templates come with free support. We want to make your life easier and make you happy about choosing our items. We have a support ticket system set up for our users, fill out a ticket and get response as quickly as possible. All support is handled through our support system and not through comments here on themeforest. Thank you for understanding! 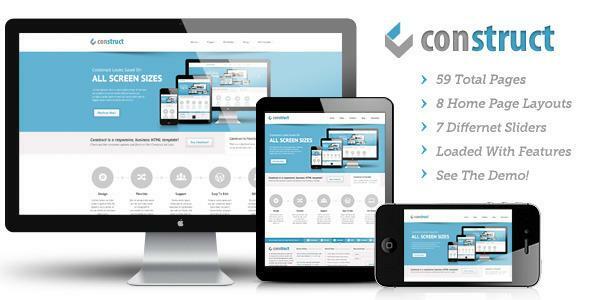 Share the post "Construct – Responsive HTML5/CSS3 Template"